Where do I use my Suffolk Hideaways voucher code? Home to an exciting array of cottages to suit all type of traveller across Suffolk, enjoy the finest self-catering accommodation in one of the most beautiful coastal counties in the UK. Suffolk is a place to unwind from the demands of everyday life. Suffolk Hideaways are pleased to offer a fantastic and ever-growing selection of cottages throughout the glorious county from little places perfect for romantic weekends to large family friendly properties! Each property is unique with some perfectly located for a range of fun activities including sailing, birdwatching, cycling or walking. If you’re looking for something a little more tranquil, don’t worry, Suffolk Hideaways have got you covered. With a range of short or long stay breaks available, your holiday is in your hands and you can tailor make it just the way you would like! No one knows Suffolk better than the Suffolk Hideaways team. That’s why they have been able to carefully select a portfolio of over 50-holiday homes that will charm and delight you. Suffolk is packed with something for everybody to enjoy. From horseracing to medieval towns and villages, restaurants, bars and much more. Enjoy lazy days by the sea or a day of discovery - the choice is yours and it’s all on your doorstep in Suffolk. 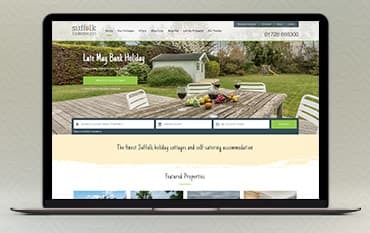 Whether you’re travelling as a couple, a family or with friends, there is something for everybody to enjoy in Suffolk so take a look online at Suffolk Hideaways and see what they can offer you and don’t hesitate to book online using one of our Voucher Codes to help bring the costs of your next holiday down! If you’re wanting to enjoy a holiday or short break away in a beautiful, UK coastal county, Suffolk is the perfect destination for you. Start planning your trip today and make sure you save money online using one of our Suffolk Hideaways Voucher Codes which you can find featured right here on our deals page. Travelling doesn’t have to be as expensive as you think and with the use of a money-saving Discount Code, your total costs can decrease quite significantly. See what Instant Savings you can make today with NetVoucherCodes and your next trip could be cheaper than you think. 52 stunning handpicked cottages are awaiting you right now at Suffolk Hideaways - all individually tailored to suit you! Browse through the fantastic array of available cottages and narrow your search using your holiday dates and preferences. From traditional, warm cottages to modern and spacious apartments or cosy getaways perfect for 2 - there is something for everybody! Stay close to the sea or near a bustling village or town centre, tailor your search to exactly what you want from your Suffolk break and start planning your next trip away now! If you want to let out your holiday property to tourists, it is now easier than ever with Suffolk Hideaways. Simply fill in the online form with your details and click submit. Once your form has been received, you will receive an email stating what steps you need to take next. Fill out your form here. Situated in the East of England, Suffolk is a country which has it all. Filled with natural beauty and bordered by 50 miles worth of glorious coastline, breathtaking skies, medieval architecture, charming villages and a bountiful selection of restaurants and bars. Whether you’re looking to unwind or explore, Suffolk is the perfect destination a break for doing as much or a little as you please. Browse online to see what Suffolk has to offer you and enjoy the wide selection of towns and villages available - all unique in their own way. Book online using a Suffolk Hideaways Voucher Code and you could grab a great money-saving deal meaning your next holiday cheaper could be cheaper than you thought. We are constantly on the hunt for Voucher Codes for Suffolk Hideaways to help you with your money saving. Our experts check dozens of sites for secret codes including NHS discounts, student sites & social media channels saving you time & money!